He built a house (probably a small one at first) on what is now Old Stockbridge Road below Hawthorne St. (which would have been in the Woodbridge Grant). The house is long gone, but there is a plaque at what is thought to be the location of his house. He is said to have sold his first house and bought the land of Jonathan Maltbie in 1782. Farming was probably the primary source of support for the family but he had a tavern license (as did many other Lenox homeowners of the time appear) and is described by some authors as being a “merchant and trader.” Perhaps this was another source of supplementary income. 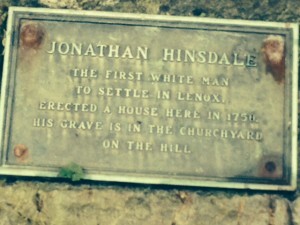 Jonathan was the son of Issac Hinsdale who was an Indian fighter in the Connecticut militia and was killed at Hatfield in one of the bloody encounters of the French and Indian wars. 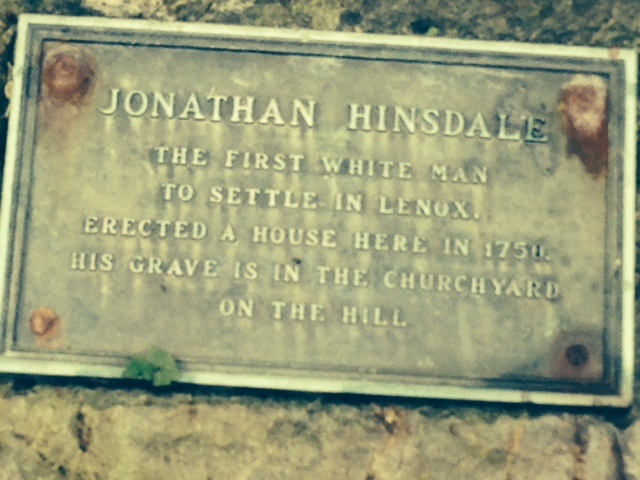 His daughter Rhoda was the first European born in Lenox in 1751. In 1755 Hinsdale and just about everyone north of Stockbridge fled to Stockbridge in what may have been an overreaction to an outlaw indian. Nonetheless a man named Stephens was shot during this flight and fell from his horse. The woman riding with him was aided by Jonathan Hinsdale. Jonathan Hinsdale apparently was swept up, along with most of the rest of the village, in revolutionary fervor, and was a signer of the non-importation agreement. He is named as one of the organizers of the Congregational Church in 1769 but in 1775 James Guthrie brought a complaint in against Jonathan regarding his failure to get his children baptized or take communion. Furthermore, Guthrie et al said he had renounced the Church covenant. Evidently a free thinker for the day, in his defense, Jonathan Hinsdale said he believed in infant baptism and that members should not have to prove they were in good standing to receive the sacrament. It was decided he could no longer “walk with them in CH fellowship….and no more expect mutual watch and care. He lived in Lenox until his death in 1811 and was buried at the Church on the Hill Cemetery with his wife Sarah, his son Joseph and his daughter in law.